Men have a 70% greater chance of dying from the most serious type of skin cancer than women, despite the disease affecting the sexes similarly, according to new research. 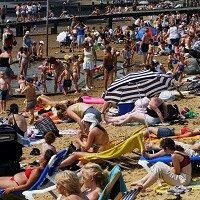 Figures from Cancer Research UK show 3.4 men per 100,000 die from malignant melanoma compared with two per 100,000 women. This is despite similar rates of the disease between the sexes. The data reveals that of the 6,600 women diagnosed each year, 900 die of the disease. Of the 6,200 men diagnosed, 1,300 die of the disease. As thousands of people head off for foreign holidays, the research highlights the importance of travel insurance for cancer patients. The organisation's figures also reveal significant increases since the early 1970s, with the death rate due to malignant melanoma in men increasing by 185%, and in women by 55%. Professor Julia Newton-Bishop, a Cancer Research UK dermatologist based at the University of Leeds, said: "Research has suggested the difference between the sexes could be in part because men are more likely to be diagnosed when melanoma is at a more advanced stage." However, she added there also appear to be "strong biological reasons behind the differences" and work is under way to work out how men's and women's bodies respond to melanomas. "We also know that men and women tend to develop melanoma in different places - more often on the back and chest for men and on the arms and legs for women," she continued. If melanoma develops on the back it can be much more difficult to spot, so Professor Newton-Bishop urged men to ask their partner to check their back for any signs on a regular basis. Sara Hiom, director of early diagnosis at Cancer Research UK, urged people to wear a T-shirt when the sun is strong and to move into the shade when possible. Sunscreen with at least SPF15 and good UVA protection is also needed to help reduce the risk of serious sunburn which can even lead to hospital treatment and a claim on your travel insurance.